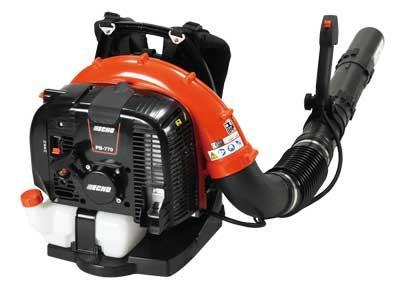 A professional grade backpack leaf blower with a specification to match, the Echo PB-770 features a host of features desired by commercial landscapers and grounds-men. The performance is outstanding with a maximum air volume of 1,302 m³/h, equating to an air speed of 91.3 m/sec, enough to remove stubborn, sodden leaves from pavements and car parks with ease. An exclusively designed closed type radial impellor promotes lower noise emissions within the interior workings and also assists the anti-vibration system to reduce uncomfortable running stresses caused by the excellent 63.3cc petrol engine. Long periods of use are less of a burden thanks to the excellent padded back harness and frame that is also adjustable to suit different operators whilst a large capacity 2-litre fuel tank reduces stoppages to a minimum. Noise is further reduced with an exhaust muffler and to keep debris from being sucked into the air intake a grid cover and leaf guard are in place; maintenance is further improved with a clip-on/off filter cover to allow for easy cleaning of the pleated air-filter. Total control of the PB-770 is possible from the hand-controls where the on/off switch and throttle latch are located. Easy starting is assured with the excellent Pro-Fire® electronic ignition system. Weight 10.8kg. Stage 2 compliant low emission engine. 'Posi-Loc' system ensures quick and easy securing and disconnecting of the blower pipe. ECHO A/V (Air Infusion Vortex) utilises cleaner burning technology. Specially designed air intake guard. Spring-mounted vibration-isolation system provdes greater operator comfort.